So, you're probably wondering what the CGCU is, and why you should care. The CGCU is the union that represents all engineers at IC. Like a big happy nerdy family. With about 4000 members. We get people from all engineering courses together with cool events and interdepartmental competitions, occasionally bring dogs in for light to moderate petting, and often scheme to steal the mascots of the other constituent unions (RSCU, RSM and ICSMU (BOO)). We're gonna put on loads of stuff for you this term. Our events are the best way to meet new people (you'd hope to follow through to friendship) from both your own department, and other engineering ones. And they're really really subsidised. Things you could never dream of on a student budget. While you're a student. The stuff of dreams. Big announcements in the next few days about big things coming up at the start of term. You won't want to miss out, promise. Tickets always fly like crazy. Dinners sell out before term even starts. Bars full to the doors with students. Dishing out condoms and lube from the office in optimistic quantities. If you haven't already, join our facebook group for updates, and to interact with fellow engineering freshers. Hope you're excited to come. We can't wait for you freshers to arrive. 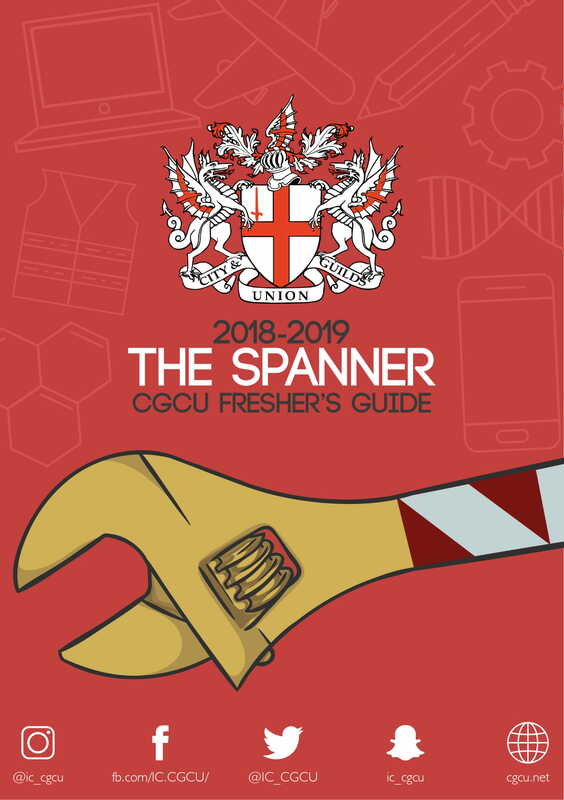 The Spanner is the fresher's guide to the CGCU, given to all first-year Engineers upon joining Imperial. In case you didn't get one, you can download it here.